Is there a way to delete all the resized images and disable creating such ones in the future? Download all the photos locally using an SFTP service, I love Transmit (paid) but you can use something like Filezilla (free) . Download all the files to a directory.
.*.txt looks for anything after the first digit to the end of the name with the extension. After completing the scripting and running it. You could blow everything away on your site and re-upload the images. If you're worried about file size I would even use imagemagick but I prefer sips to reduce the compression size of the images. No idea, how to remove existing images. But you can stop generating image sizes for new images you are going to upload. It'll give you the same output. You can even choose which of the image sizes you want to be prevented from creating. If coding is not your strongest point you may want to look at a plugin solution. I must admit that I have not yet used the first one - Media Cleaner - so I cannot provide you with a solid opinion. I have used though the second one - Optimize Images Resizing - and had the expected results. I cannot stretch enough the importance of creating a full backup of your WordPress installation (both your uploads folder and your dB). I do understand that we are talking about 20GB but a backup is essential, especially in this unique situation. This procedure is time consuming as well as heavy on the server. It is wise to put your site in the maintenance mode. After all is done use your favorite Regenerate Thumbnails plugins to get your WordPress/themes image sizes back as well as install EWWW Image Optimizer and Imsanity. This combination will guarantee optimized, resized, only necessary images. "Files detected as un-used are added to a specific dashboard where you can choose to trash them. They will be then moved to a trash internal to the plugin. After more testing, you can trash them definitely". Some plugins may clash with it. If that happens and assuming you are on maintenance mode, deactivate all and do your cleaning. "TO REMOVE image sizes generated prior to activating the plugin, visit the Settings -> Media and use the button under "Remove image sizes" to perform the cleanup". Includes functions like: Creating backups of your uploads, analyzes your uploads directory, giving you an overview how many original files and thumbnails there are, restores backups in case you have lost a file that was not supposed to be deleted. Please let us know how you achieved the best results. To remove all superfluous image files, we'll have to loop through all posts, find the attachments to those posts, establish which attached image sizes are no longer needed and remove those files. Here we go. I'd give this code a thorough test before applying it... With 20GB in images it could also take a while to execute. If you have SSH access then you can run the following commands to list and remove the resized images. Later you can rebuild them. # List all resized images. # Remove all resized images. Be careful here. Keep your backups ready. P.S. My server has an NGINX setup which is why the site paths are /var/www/"$1"/htdocs/ $1 being the parameter which is the site name. You can modify it to match your path. 1) To stop WordPress from creating multiple image sizes upon uploading of an image, you can accomplish this without using a plugin. Navigate to Settings > Media in the admin section. 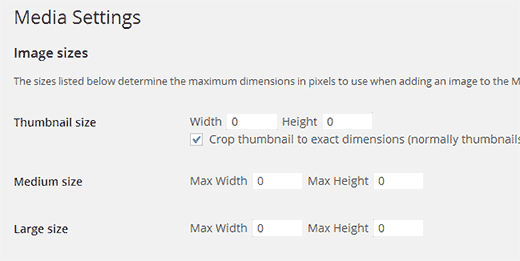 By setting the sizes to 0 you will disable WordPress from creating default image sizes and only the original image will be stored. 2) To reduce the 20GBs of images you have on your site, I would simply SFTP into your server and manually delete the different sized images. From the root directory of a WordPress install, navigate to wp-content/uploads/<yyyy>/<mm>/ and you will find all of your images and media uploads. You want to be sure to leave the original image, or else you are simply deleting the entire image. Any image file name with an extra - ###x###.jpg is an auto generated image. The original image would not have this in the file name. As an aside - to help you with your images I would check out WPMU DEV's WP-Smush plugin. It's really great and when you upload images it automatically uses their servers to crunch and compress images before storing. It also can size down large resolution images to a reasonable maximum size. You really shouldn't have to display an image that is bigger than 2048x2048. 1)You should start by removing any unneeded image sizes from your relevant files e.g. functions. PHP in your theme and any plugins if the exist (e.g. rudderless). 2)Next you can delete all required image sizes via ftp. 3)Then you need to regenerate the thumbnails (e.g. all the image sizes that Wordpress is being told to create.) You can use any 'Regenerate thumbnails' plugin from the WP repo. 2) There are a couple of plugins in the plugin directory(repo) which will delete all WP thumbs and then only generate the thumbs when they are called for the first time on any given page on your website. On subsequent request for the image, the image will already exist and be served as normal. The benefit of this is that thumbs are only created for images/sizes that are actually required by your site. However, images called in non-standard ways may not get generated. If you want to reduce additional overhead from excessively large original images you can use 'imsanity' plugin to reduce the physical file size of these originals down to a size of your choice. It's a great tool for sites with user submitted images. How can i identify media uploaded to my website that is not being used anywhere anymore?